Happy Halloween! I am looking forward to a new week, as this past one was a hectic one! I wanted to share this look I wore in NYC last weekend with my family. This fringed cardigan was perfect for the temps while we were there. It was cool enough to where you needed a jacket, but it was not cold enough for winter coats! And, this little cardigan fit the bill perfectly! I purchased this black body-con dress last year from Target, and I have gotten SO much wear out of it. Unfortunately, I could not find this exact one online for y'all. However, I found two that are very similar options linked above. 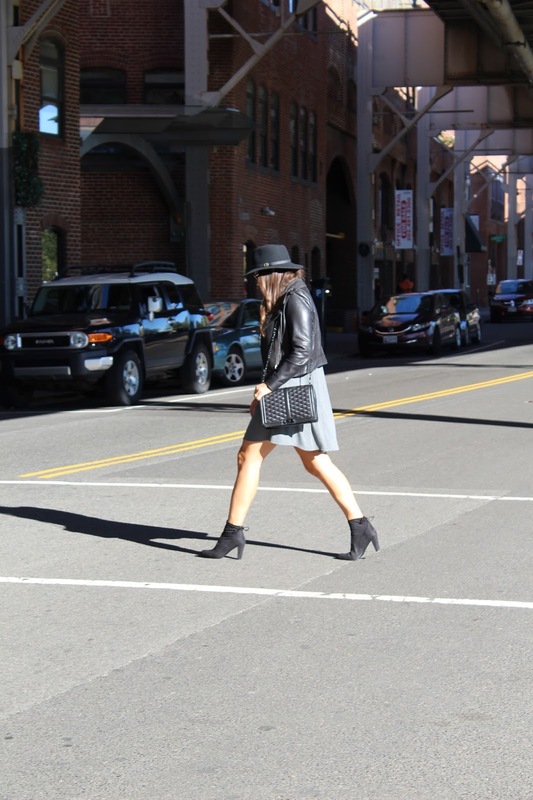 I highly recommend a simple piece like this LBD, as it's perfect for layering this time of year! 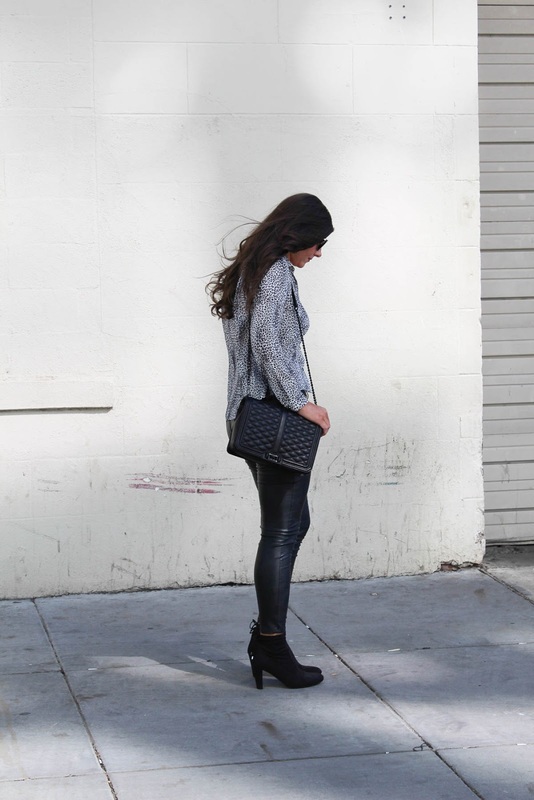 Seriously, I have styled it so many ways - with a leather jacket, leopard faux fur coat, and with a duster cardigan. I hope you have a safe and wonderful Halloween!! Happy hump day! I am loving the bold colors this time of year! I have had my eye on this Mara Hoffman dress (loving it in this style too) for awhile now! 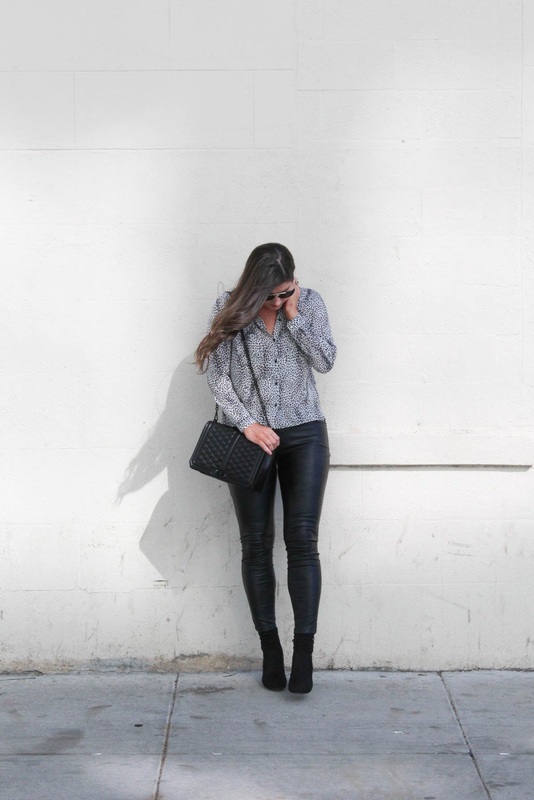 You cannot beat a bold print this time of year paired with a black leather jacket, an essential for the temps right now. 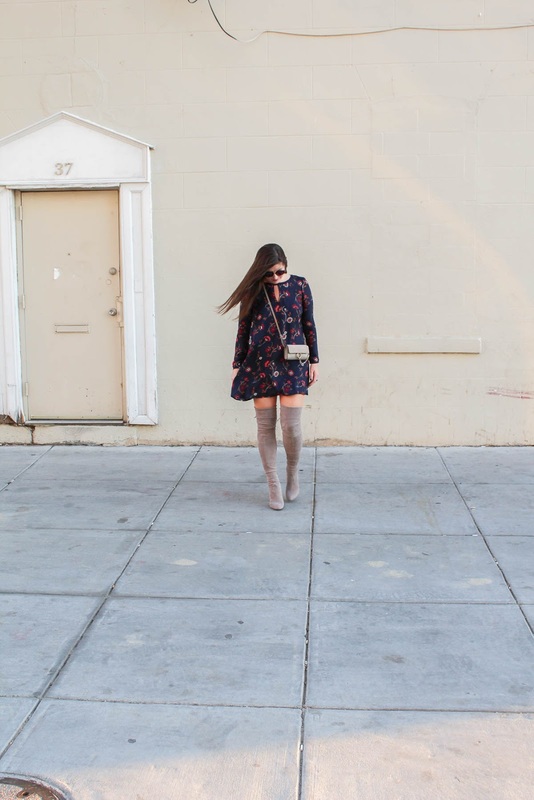 I am having a major moment with OTK boots this month. They really can just do SO much for an outfit by taking a simple shift dress like this (only $48!) up a notch! Add a belt, and you're really golden! I hope you are having a great week! As always, thank you for stopping by! Happy Tuesday! I hope you had a fabulous weekend and that your week is off to a great start! We had a great time in NYC with my family over the weekend, and I am still getting back in the swing of things this week after having my sister, brother-in-law, and nieces in town the last few days! We had the best time together, and I was so very sad to see them go. Living far away from my family the last few years has definitely made me cherish each visit I get with them even more, and I have to admit this time was one of the best! So, my apologies for missing yesterday's post! Now, onto today's look. I purchased this Cupcakes and Cashmere dress after seeing it online at Revolve. I just adore the dark, navy floral print accented with the gray accessories... navy plus gray will forever be one of my favorite combos! 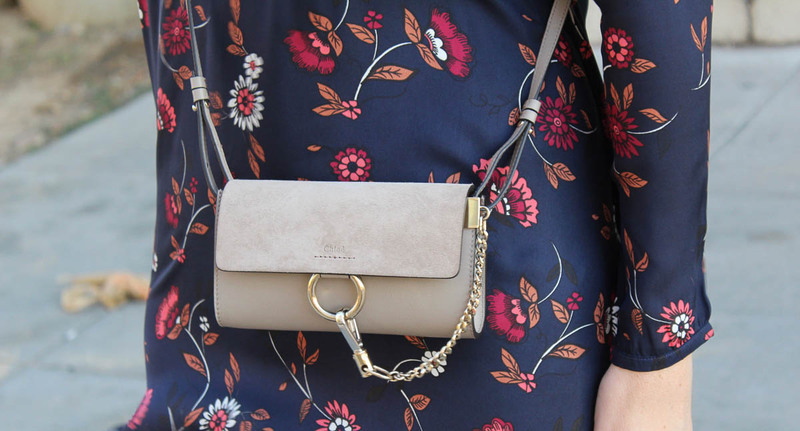 Lastly, let's talk about this fabulous little Chloe bag. I have been lusting over this version for the last year, but I could never seem to pull the trigger on it. And, now I am so glad I waited! This smaller version just came out this season for almost half the price, and I could not be happier with this little bag! The best part for any of you college football fans (or NFL for that matter) is that this bag is stadium approved! #firstworldproblems I know! I hope y'all have a great day and thank you for stopping by! Happy Friday!! This week has flown by, but I am super excited for the weekend! 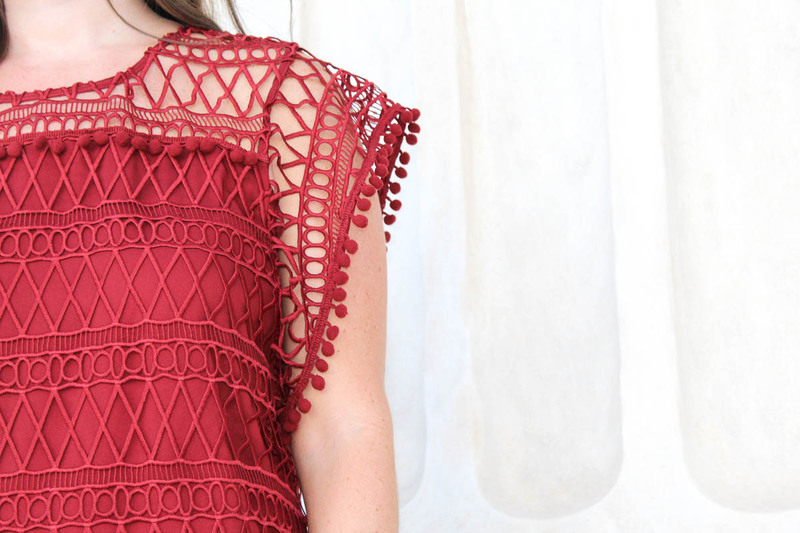 Today, I wanted to share this dress from Revolve that I adore with its pom-pom trim! I had my eyes on this same style from Tularosa this summer, but I never pulled the trigger on it. 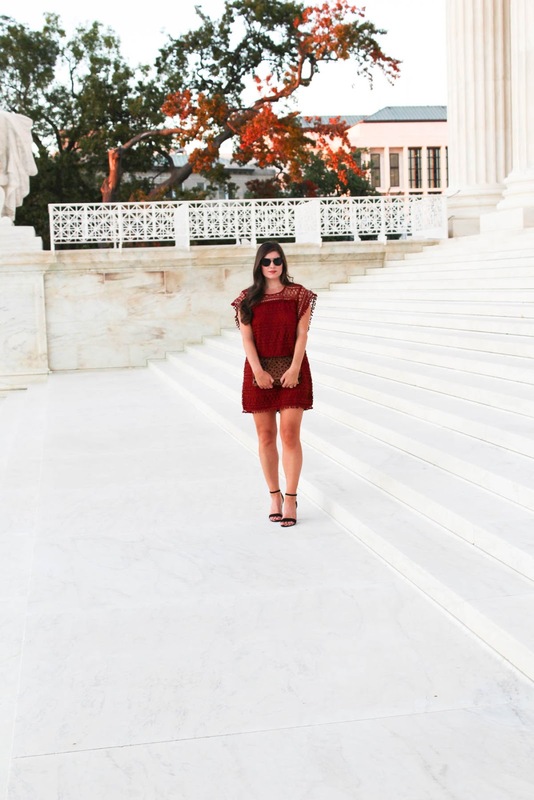 When I spotted this dress in this updated fall color, I just knew I had to have it! I do think I could have gone down a size, as it's a little boxy. However, I adore a shift dress like no other! Also, it comes in a top version that I think would look fabulous paired with a black leather skirt! I hope you have a great weekend! We are headed to NYC tomorrow morning with my sister, brother-in-law and nieces, and I am so excited to explore the city with them and take my nieces to Soho for a little shopping! 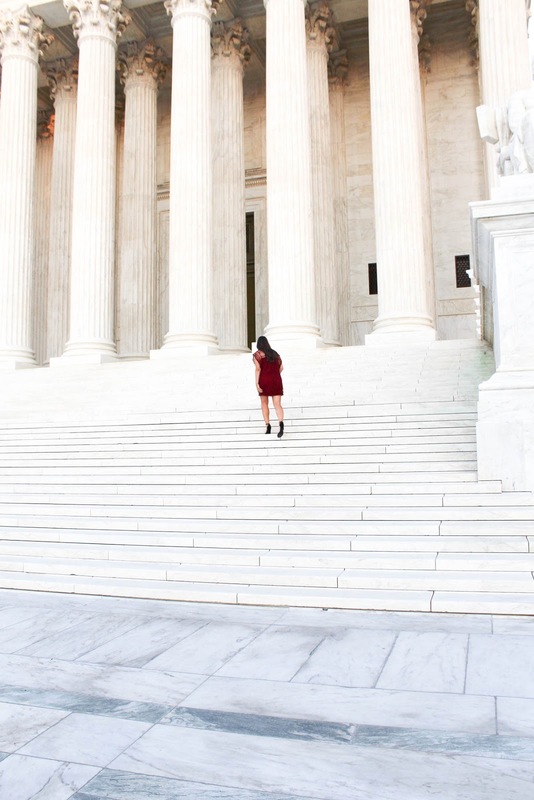 Be sure you're following along on Snapchat, @courtkowalski, and on Instagram, @currently_courtney, to see where all we go! Hope you're having a great week! Today is all about some handbag inspiration for less. 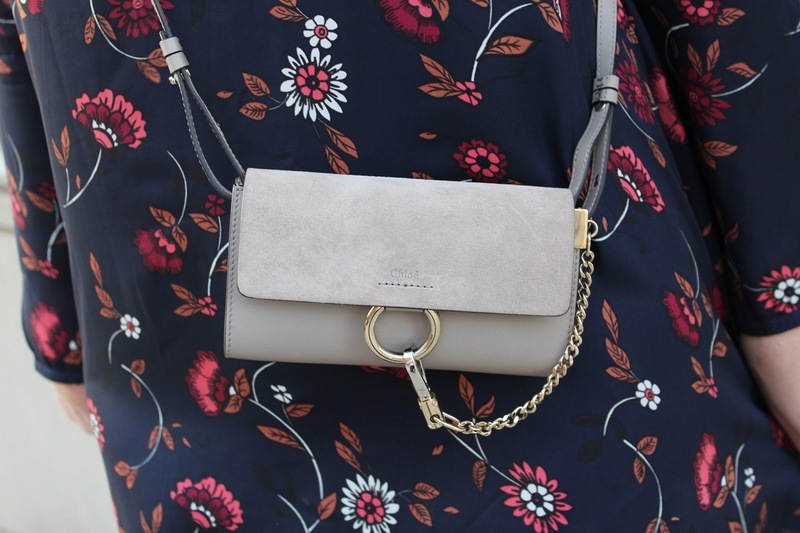 These are a few of my favorite handbag styles right now, and the dupes I have seen lately for each of them are just too good not to share! Especially that bucket bag! I think the bucket bag is a trend that will eventually wear off over the next few years. And, in my opinion, the look for less is just as chic! Also, I have had my eye on the chain city bag from Zara for quite awhile now, as I just love the edgy vibe it gives off. What's not to love with the black embossed leather, chain detailing, and silver toned hardware... just amazing all around! I hope you're having a great week! My sister, brother-in-law, and nieces arrive into town today, and I am SO excited to see them! It's going to be a busy few days with them here, but I plan on soaking up every bit of time I get to spend with them! My heart could just explode, as I anticipate their arrival! Thanks for stopping by, and I hope you have a great day!! Happy Monday! 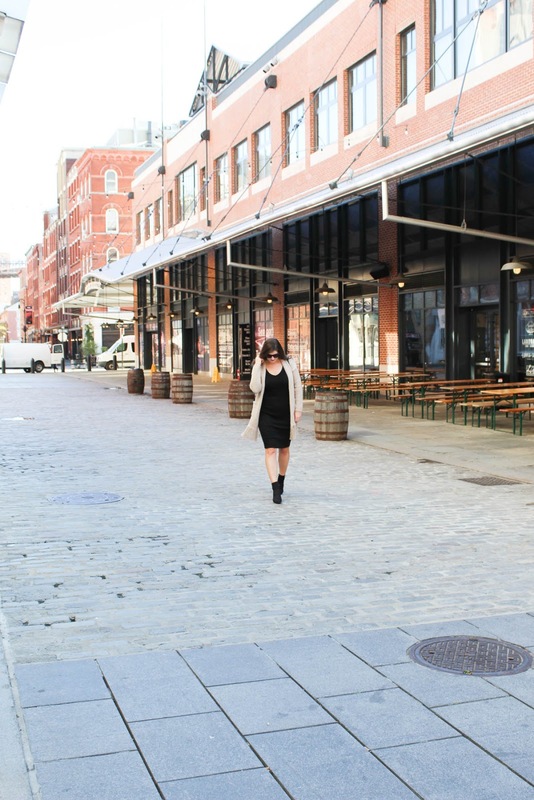 I wanted to share this look I wore last weekend here in DC, while we were in Georgetown for the afternoon. I actually wore this dress again this past weekend while traveling, styled with a long, duster cardigan over it and it was so comfy yet put together. I grabbed this dress in Target a few weeks ago, and I think I am going to order the black one too. 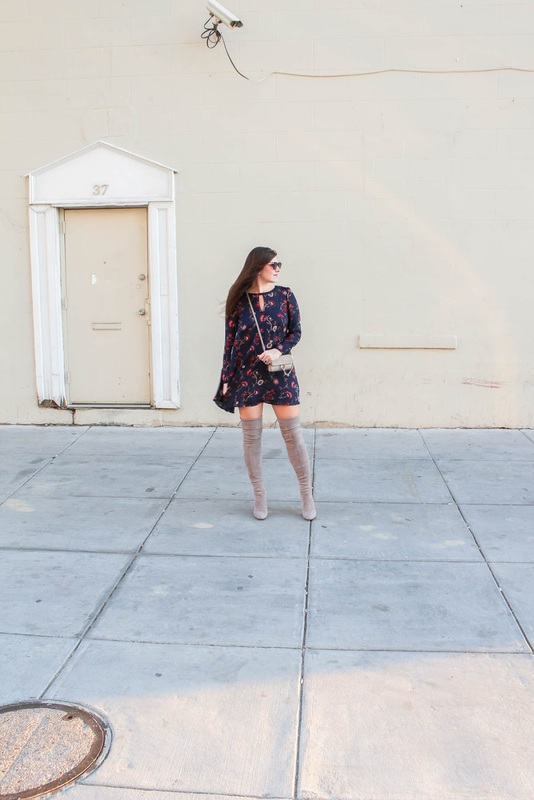 It is so versatile, and I know it will be one of those easy dresses that I reach for all season long. We just got back from a great weekend in Knoxville with family and friends for the Alabama vs. Tennessee game, and I am writing this from bed about to doze off! I hope you have a great start to your week! As always, thank you for stopping by! Happy Friday!! I want to take a minute to talk about these booties. 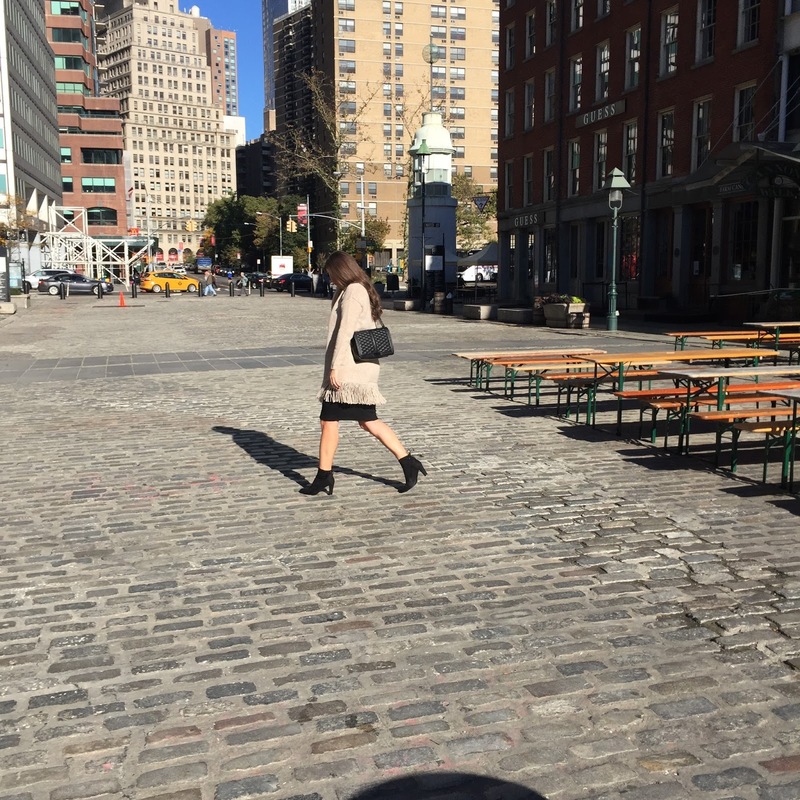 I have had my eye on these Stuart Weitzman booties for quite awhile, as mentioned in this post here. The other day I was browsing DSW after realizing I had a discount code that I needed to use. You know how it goes - you get the discount code so you feel wasteful if you don't spend it and "save" when you're actually not saving because you're spending. You know what I mean?? I've heard the speech a million times from Buddy, but I am a woman and it just goes in one ear and out the other... ya feel me? Anyways, I came across these, and I just could not believe the similarity between them and the Stuart Weitzman booties. And, best of all - the price tag! I immediately ordered them in black, and I have already worn them three times this week. They are so perfect for work or play! Most of all, they are SO comfortable! I will definitely be going back for the taupe pair. I hope you all have a great weekend! We are headed to Tennessee to visit some family and friends and attend my husband's favorite rival college football game of the year - Tennessee vs. Alabama. I am so excited to be down South for a few days, and I am especially excited to see the beautiful Smoky Mountains this time of year! I am forever a Mississippi girl, but there is no denying that the Smoky Mountains are a sight to withhold! Have a fabulous weekend, everyone! Happy hump day!! Some fall inspo for you today. I am loving the bold colors in this palette. You might remember my one-shoulder bodysuit from this post, which I have gotten so much wear out of tucked into skirts, shorts, and planning soon to style tucked into jeans with this belt. The options are endless! I think the gold detailing on these pumps sass up any outfit adding the perfect final touch. 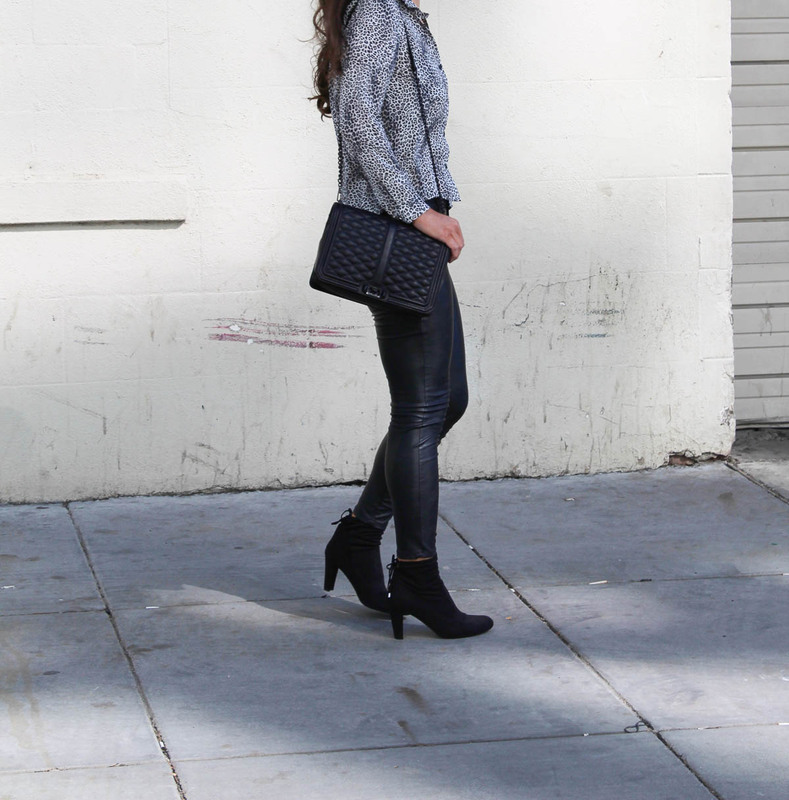 Also, the booties linked above are such a steal and so very chic! I hope you are having a great week, and I will be back on Friday with a new outfit post for y'all! Happy Friday!! Hallelujah for the weekend!! I'm feeling super thankful for Mr. Columbus today, as we head into the long weekend (insert praise hands emoji)! 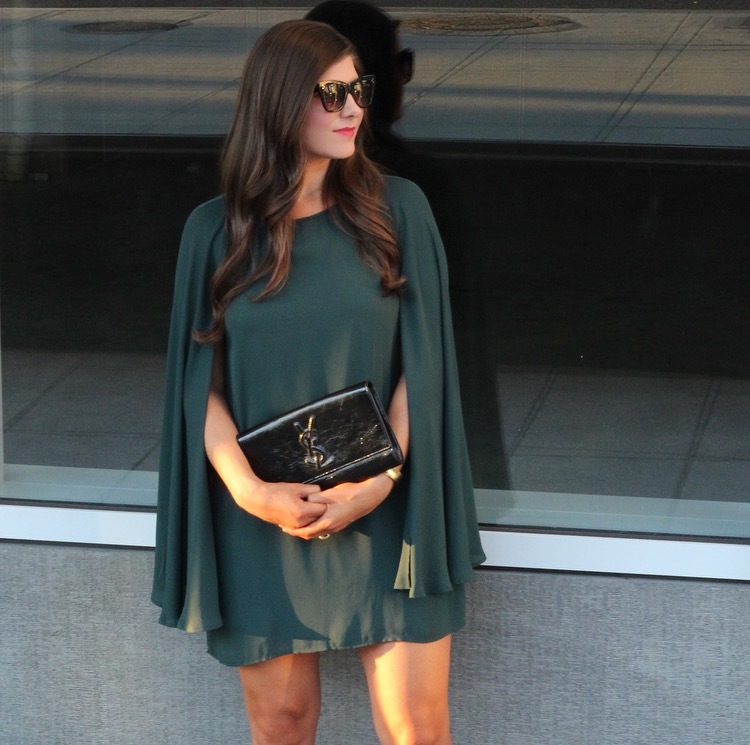 Today, I wanted to share this cape sleeved dress that is just too good to pass up. You might start to think that I'm sponsored by Forever 21 this week after Monday's post and now this one, but I'm not! I recently went in there and just had some really great luck! Sometimes I go in there and don't walk out with a thing, but this time around I happened to scoop up a few things! This dress reminded me so much of this one from Trina Turk, so I just had to have it! 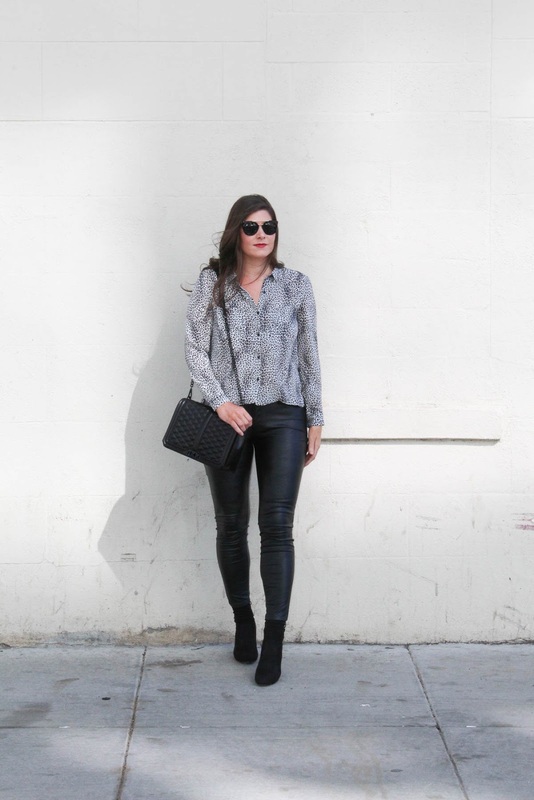 It's such a chic and sophisticated option for any event or even just date night. Most of all, I love the hunter green color - one of my favorite colors to accent with leopard accessories. I hope you have a great weekend! We don't have much on the agenda, and I couldn't be more excited about it! This color palette!!! I adore it so very much! These were actually our wedding colors, and I still love the combination of these colors together each time I see it! So feminine and chic with a bit of edge... I love it all! I am especially loving these Gucci loafers, and I think they would look awesome paired with a chunky sweater and these jeans. I love a hat, and I'm not sure anyone does a fedora better than Rag & Bone. I recently just added this one to my wardrobe. I hope you're having a great week so far! I am so looking forward to the long weekend!! Thanks for stopping by! How is the weekend already over?! I hope you had a great one. Mine was spent puppy sitting a dear friend's little dog named Scout and celebrating another friend that's making the move back home! Onto the outfit, I picked up this sweater and skirt from Forever 21, and I really feel like I hit the jackpot with this find. I will admit that sometimes when I go in there, I just get so overwhelmed and end up walking out empty-handed. However, this pairing was on the manikin and well, clearly, they sold me. I love the chunky sweater, skirt, and OTK boot combo so much. It is most definitely my fall uniform! I will be recreating this look so much this season, so I hope you like it! Also, I picked up these Steve Madden "Gorgeous" boots last year, and I still love them! 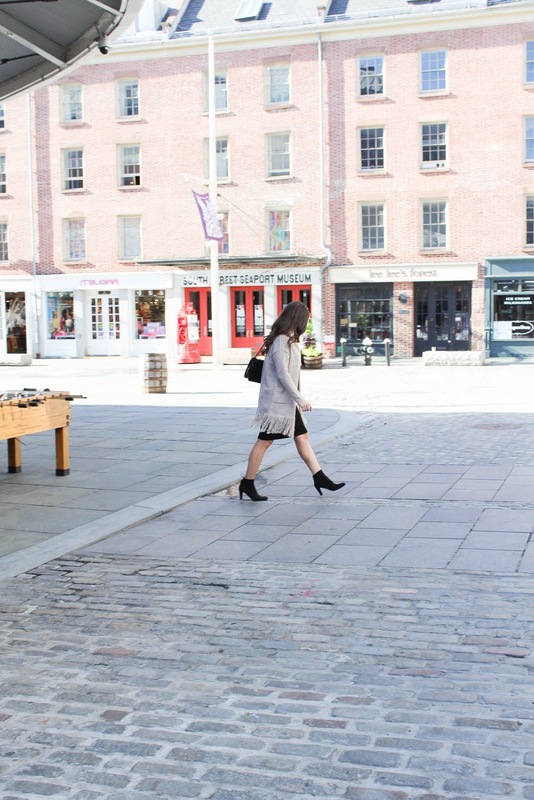 I splurged on the Stuart Weitzman "Highland" boots last year (as seen in this post), which I still highly recommend. However, I couldn't get them in two colors all at once, so I grabbed these in black instead. And, y'all - I'm not gonna lie, I absolutely love these. They are so easy to slip on, comfortable, and a spitting image of the Stuart Weitzman Highland boots. If you are looking for a similar pair to the Highland, then these are for you. They do run about a half size to a full size larger than normal (so size down), but they are worth every penny! I've also linked some others below that are similar in price that I'm loving!